Just a short one today - I haven't done one of these style posts in a while, so thought I'd revive it now all the shops are full of A/W goodies. 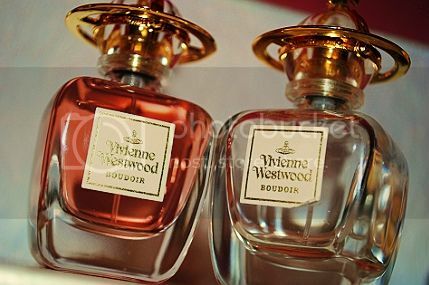 1: I bought a new bottle of my favourite perfume - Boudoir by Vivienne Westwood. I've missed it! 2: During the last days of nice weather, my uncle had his annual BBQ. Unfortunately I wasn't feeling up to it after working two long shifts in a row, so I woke up after a long nap to a big plate of leftover food my family brought home. Nom. 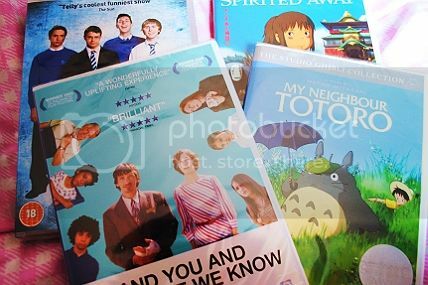 3: I treated myself to some new DVDs: The Inbetweeners Series 3, Spirited Away, Me and You and Everyone We Know and My Neighbour Totoro. I can't believe my sister has never seen Toroto - this has to be rectified soon! Mind you, Italian Catholic Mother's Christmas cards and wrapping paper did arrive today from the Studio 24 catalogue. The Santa is a bit too skinny for my liking, though. I love all of those things! I like that DP is doing a collection of colour dresses for a/w black and maroon get boring. oooo I love the New Look bag! I'm going to try mix up my wardrobe this A/W rather then buying loads more stuff as I usually do......wish me luck! Youre not wrong about that Santa-- what an enviable waist! I love your pics, the dress is so cute, I may have to purchase it! 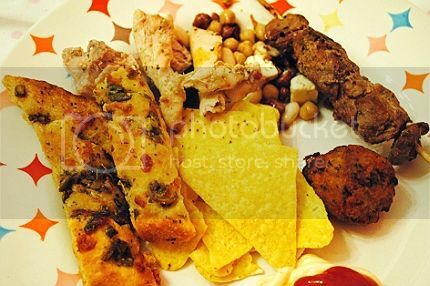 Also I am very jealous of that food it looks absolutely gorgeous! I love all of these things! and I want a dress like that so bad! I love the New Look satchel and the glitter shoes, love love glitter. I have never smelled any Vivienne Westwood perfumes, I will have to check them out. The santa is looking a bit to skinny there.. he needs to look more cuddly! I just cant stop LOVING your blog! Oh good God, NEED those glitter shoes! And yes, the santa is far too skinny. I have that fox scarf on my wishlist too, lust! oh and also, yay mittens! Fab selection, love the bag,dress and Newcastle roller gal brooch, bit of sparkle for the tootsie shoes to :D can't go wrong with that.